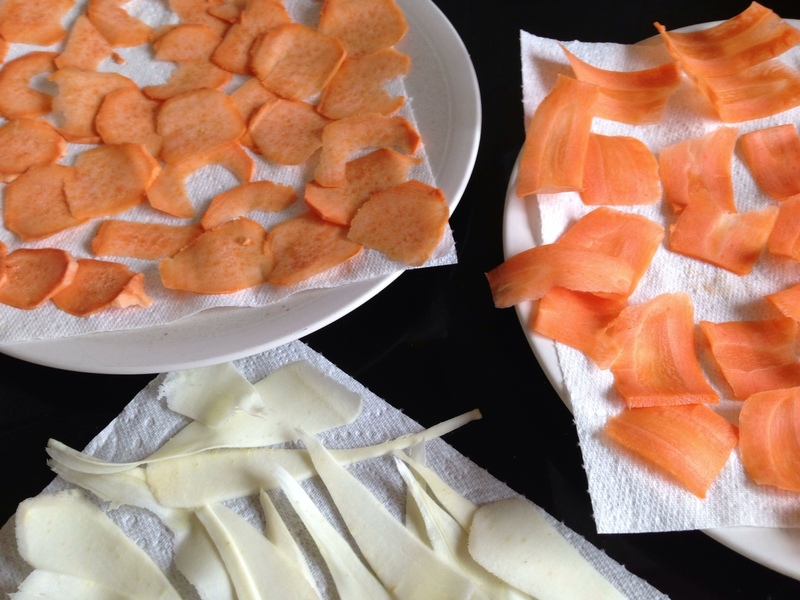 You are here: Home / Healthy & Delicious / Kids, Make Your Own Crisps for Your Lunchbox: It’s Easy! 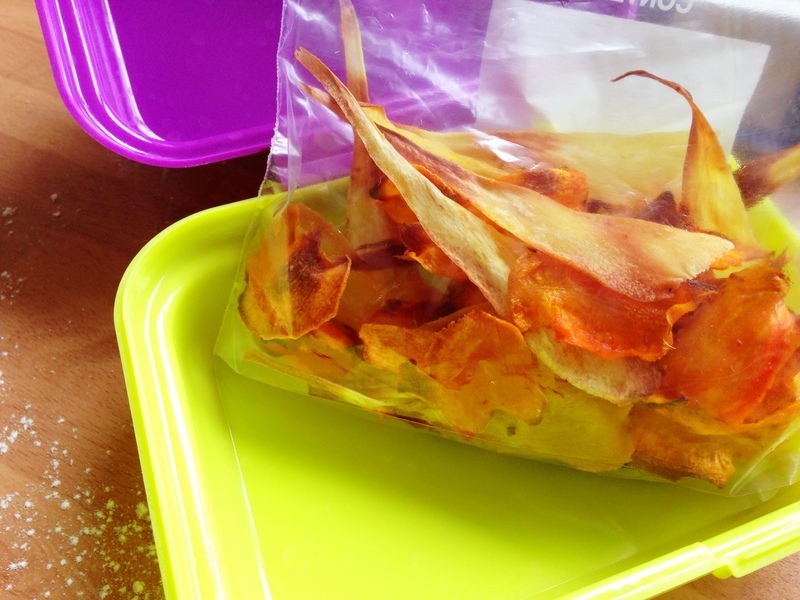 Kids, Make Your Own Crisps for Your Lunchbox: It’s Easy! So you want to make your own crisps? This is a lot easier than you might think, and doesn’t take that long to do either. 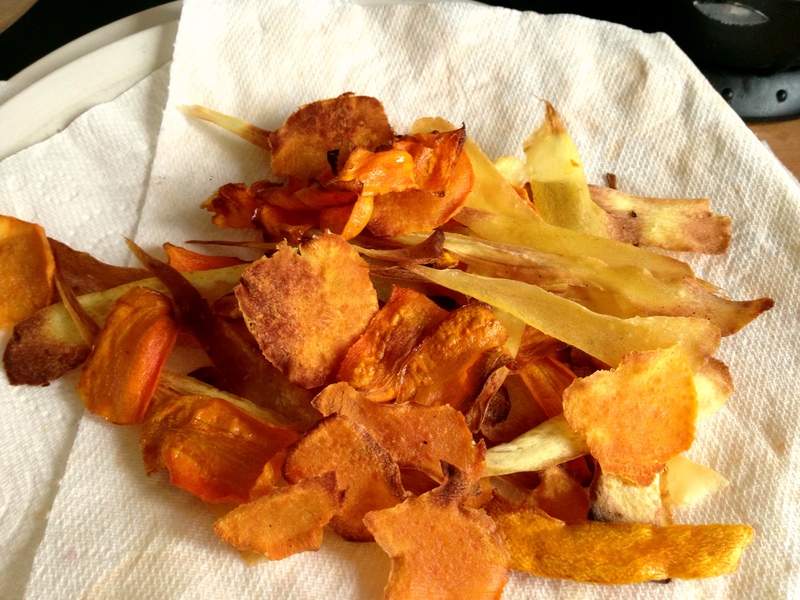 Here we have made vegetable crisps using parsnips, sweet potato, and carrot as this makes them a little bit healthier, but it works just as well with potatoes too. Stick a bag of these in your lunch box, and your friends will be sooo jealous! * Start off with a whole vegetable of each as it’s easier for little hands to hold, but you’ll only use half of each. 1. 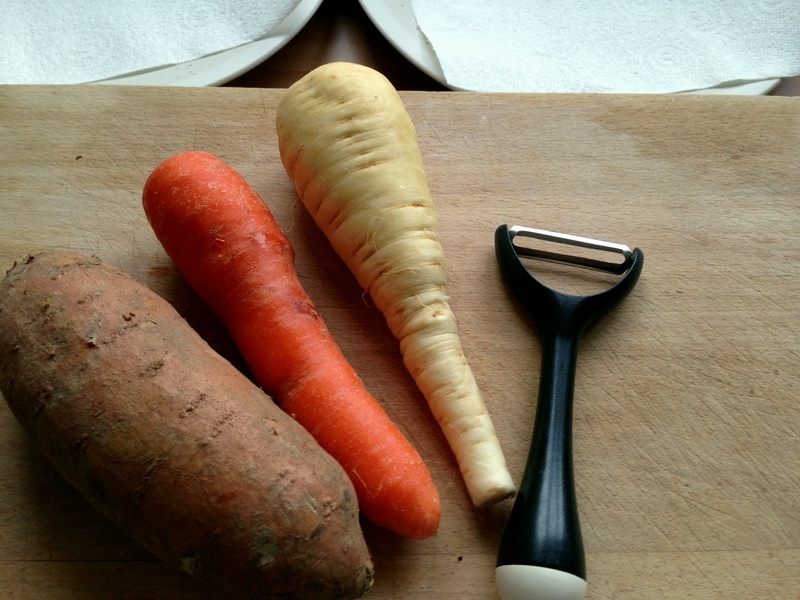 Peel your vegetables, and get a grown-up to cut the sweet potato in half width-ways so it’s easier for you to hold. 2. Hold a vegetable in one hand, and using your other hand, pull the easy peeler down from the top to the bottom, shaving off some of the yummy veggie along the way. 3. Put your vegetable strips onto kitchen roll to dry and get out some of the moisture. You can even leave them out like this for a few hours–you need the vegetables to be as dry as you can. 4. Heat the oven to 180c, 350f, gas 4. 6. 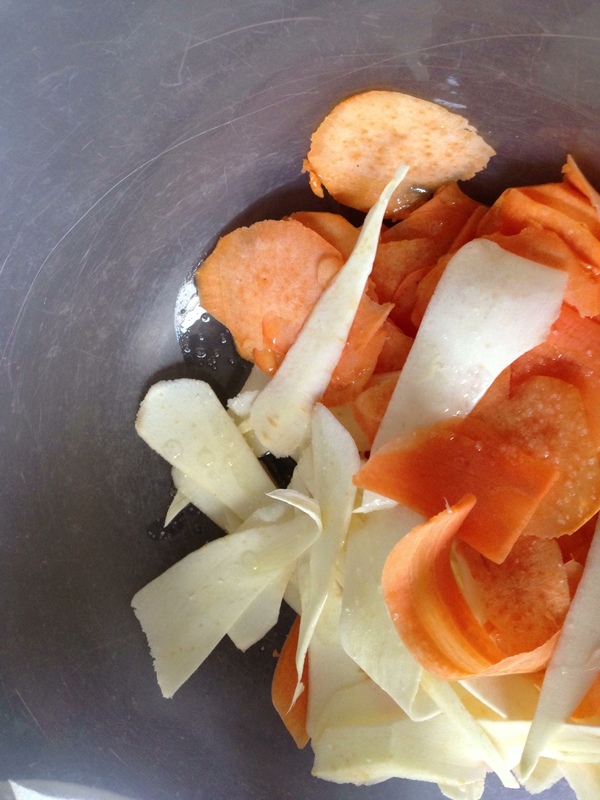 Get your hands in the bowl and mix them around, making sure that all the veg crisps are coated in the oil. 7. Lay out your crisps onto a baking tray, but do not overlap them as them they won’t cook properly. You made need to do these in a few batches. 8. Get a grown-up to put your tray of crisps into the oven, either on the middle or bottom shelf. Set your timer for 8 minutes. After the time is up check on your crisps, and give them another 2 minutes if they don’t look ready. They should be darker in colour, especially around the edges, and crispy. 9. Put these crisps onto kitchen roll to get off some of the oil. Once they are completely cool you can store them in an airtight container. They will last for a few days, but are so yummy you’ll probably have scoffed them all by then! Try experimenting with your crisp flavours by adding herbs or spices: paprika, mixed herbs, mild chilli, and pepper all work well. Or try making crisps using different vegetables such as beetroot or turnip. So, do you think making your own crisps is better than the ones you buy in the shops? These crisps use a lot less oil than the bags of crisps you buy as they are oven baked and are just lightly coated in oil, plus these vegetables have lots of great vitamins in them to keep you strong and health too. Thanks so much for sharing your homemade veggie crisp recipe, I shall be bookmarking! I’m putting together a fun school project on healthier snacks and thought I’d try my hand at veggie and fruit crisps. Off to have a look around your gorgeous site! Make yourself at home 🙂 The key is in getting as much moisture out of the veg as you can. I tried to make them more quickly once and they did not turn out well!